While many boat owners are consumed with the annual task of hauling and storing their vessels for the winter, others are prepping for the cold months by turning theirs into a stationary den. 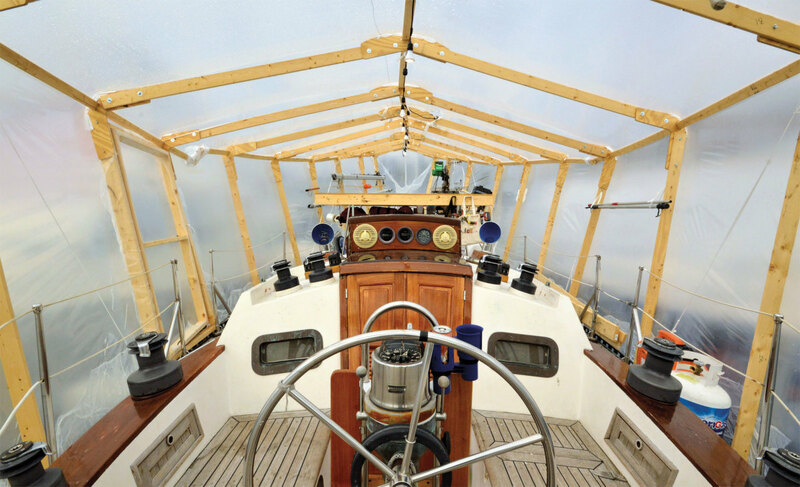 I liveaboard in the snowbound Northeast, where most liveaboards cover their decks by erecting a temporary structure to be wrapped in heat-shrinkable plastic sheeting. 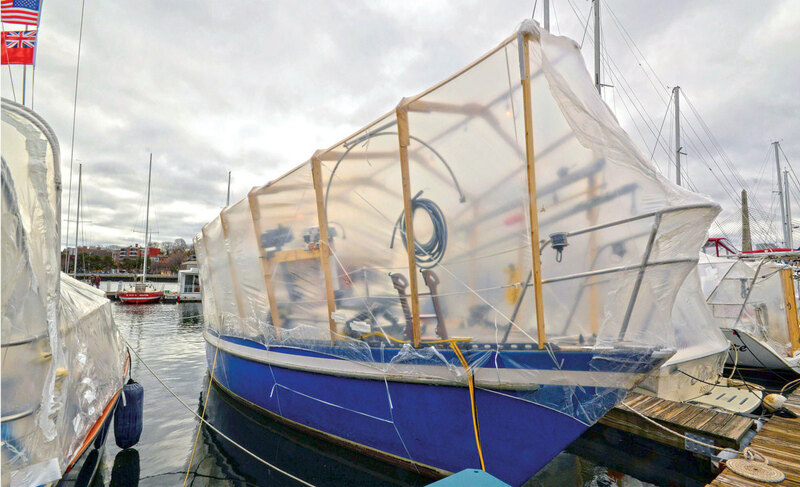 Such a shrink-wrapped cover adds a layer of protection and comfort for the ship and her crew by helping to shed rain and snow, reduce condensation and provide passive solar heat during the day. 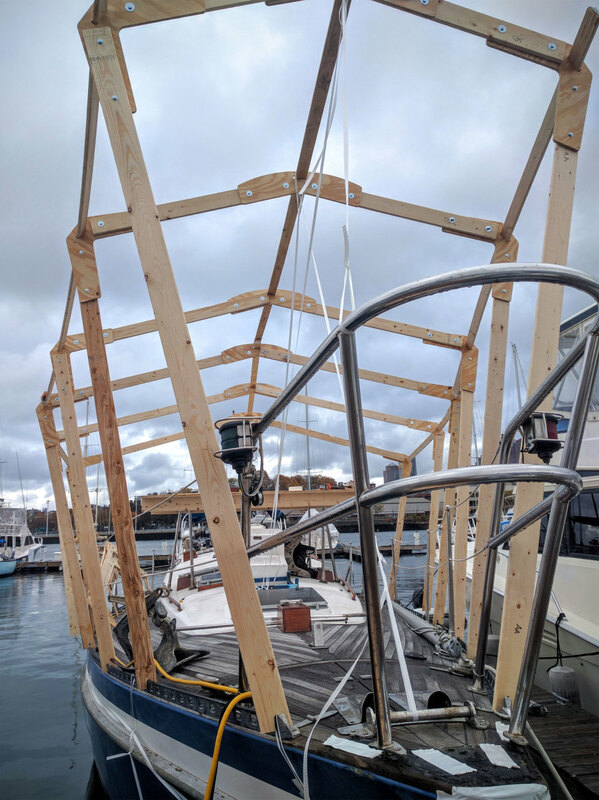 Last winter I decided to build a seasonally reusable structure that offers plentiful space to do the only thing I love more than sailing—boat work. Here are the steps I took, from conception to realization, in making a functional winter boat shop under the shrink-wrapped shelter on my Tayana 42, Eclipse 1. Even if you don’t want an onboard workshop, this frame concept will work for just about any boat. Choosing Materials: Galvanized electrical conduit is the most common choice for reusable shrinkwrap frames. It’s a great choice and allows for easy assembly. It’s also compact when broken down, and quite strong. I previously built a frame from metal conduit. However, I decided to rethink it this time around. Wood is less expensive, faster to cut, doesn’t require bending and is lighter. Roof Pitch: The weight of the snow on a frame can make it collapse, so a proper pitch on the roof is necessary to allow it to slide off. Too much of a peak, however, makes the structure extremely difficult to cover in plastic since the peak is out of reach. The angle at the peak of my structure is 30 degrees. Stubborn snow can be persuaded from its perch by banging at it from the inside. Elbow Room: From previous experience, I knew that proper headroom isn’t the only thing necessary under the wrap. Elbow and shoulder room is critical while walking along the side decks. Ease of Assembly: If you’re going to reuse your frame, be sure to label all of the parts. Each of my frames is designed to fold up after I remove the wingnuts and bolts from each plywood joint. Watertightness: Unstepping the mast was a critical part of making my frame easy to cover and completely watertight. It was also critical for positioning a work bench over the mast pulpits. If you’re not setting up an on-deck work station, you may well want to leave the mast in place, in which case you’ll have to design your frame around it. CAD Software: I’m not formally trained in CAD software or in drafting. However, modern computer drafting software has really lowered the bar for doing work like this. I used OnShape (onshape.com), for its free web-based CAD software. It’s also easy to learn how thanks to an abundance of online tutorials. To design the frame, I took an image of the deck profile of my boat and imported it into the design. By stretching it lengthwise to its 42ft LOA I then had a very close representation of Eclipse 1’s profile. This served as the guide for the lines I drew to represent each frame. The Workbench: I am very lucky to have stable mast pulpits on deck that, without a mast in place, would support a table. The workbench was the first thing to be constructed and continues to be the pièce de résistance throughout the evolution of winter boat projects. Construction Directions: I manually took the dimensions from the CAD drawings and created a spreadsheet with the lengths of the various timbers that would make up the frames. I cut these accordingly. Each of the frame legs was notched with a router so that they would sit securely over my slotted toerail. I created jigs for all notching and drilling, which made the production of the parts that much faster and easier. Mistakes: Not accounting for the rise of the sheer both fore and aft was a critical oversight on my part. 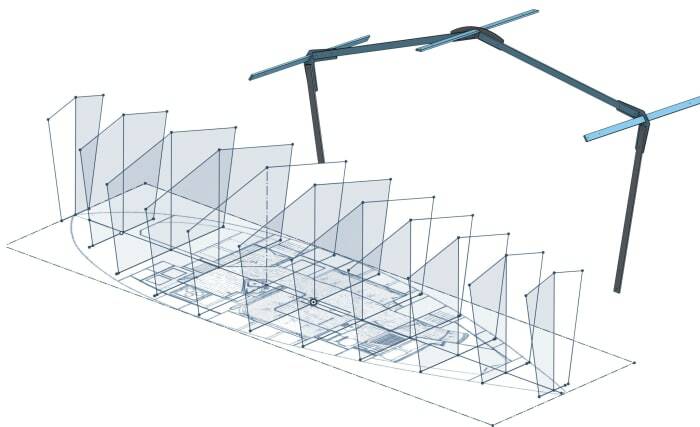 When making my original CAD drawings, I designed all the frames on a flat plane. In the end, everything worked out OK, but assembly was definitely more difficult than it should have been, as the wood used for the fore and aft ridge elements needed to be bent into place. Assembly: I have one thing to say—the more hands the better!